82 million years ago, a vast sea covered the land that is now Kansas. In this sea, lived huge marine animals, such as the Plesiosaur. In more recent years, Native Americans lived on the land, which was made part of Indian Territory in the 1830s. White settlers initially thought Kansas lacked the resources needed to settle it. Later, they fought American Indian for it. During the 1850s, people in Kansas were fiercely divided over the issue of slavery. Violent clashes became a common problem. Kansas lies in the middle of the country. It is bordered by Colorado, Nebraska, Missouri, and Oklahoma. Summers are warm and dry; winters can be cold and windy. Thunderstorms sometimes bring hail or tornados. Kansas is mostly flat prairieland. The Tallgrass Prairie National Preserve is one of the last places in America where native prairie grass grows in abundance. Most prairie land has been turned into farmland. Kansas is the leading grower of wheat in the United States, producing more than 362 million bushels each year. It’s also a large beef producer. The Anatoly Karpov International School of Chess, in Lindsborg, Kansas, was named for the famous Russian chess player and 1975 world champion. 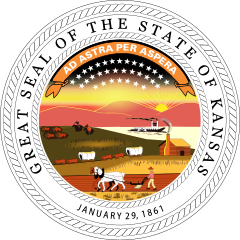 Question: Where did Kansas get its name? 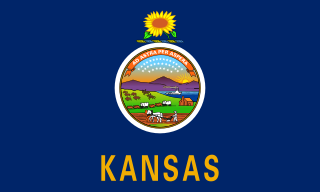 Answer: The word Kansas comes from the Kansa Native American people. The name Kansa means “people of the south wind.” Kansas is also called “The Sunflower State” for the sunflowers growing through most of the state. Watch a video about Kansas. Declan, Tobin. " Fun Facts for Kids about Kansas ." Easy Science for Kids, Apr 2019. Web. 25 Apr 2019. < https://easyscienceforkids.com/kansas/ >.